When the Anglo-Saxons Came to Britain what clothing did the wear? Objects found in graves as well as illustrations in Anglo-Saxon scrolls and books, stone engravings and images on objects can all give us a clue. 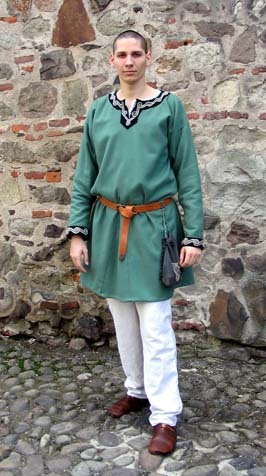 Male clothing included shirts made of wool or linen and some form of loin-cloths. On their legs they wore woolen trousers or sometimes leggings. Over this was worn a tunic to mid thigh or even reaching to the knees. It could be plain or have decorations around neckline and wrists. A belt worn at the waist provided a practical location to hang a pouch, knife or seax and other accessories. Shoes were made usually from leather fastened with toggles and loops. Women like men would usually have a belt, carry a small knife and pouch but also the senior female would carry keys to lock the store of food. Anglo-Saxon children wore clothes similar to the adults. Boys: trousers with a tunic and a belt at the waist, like men. Girls: a tunic dress band maybe an over-dress held together with a pair of brooches at the shoulders. Women and girls wore a lot of jewelry . 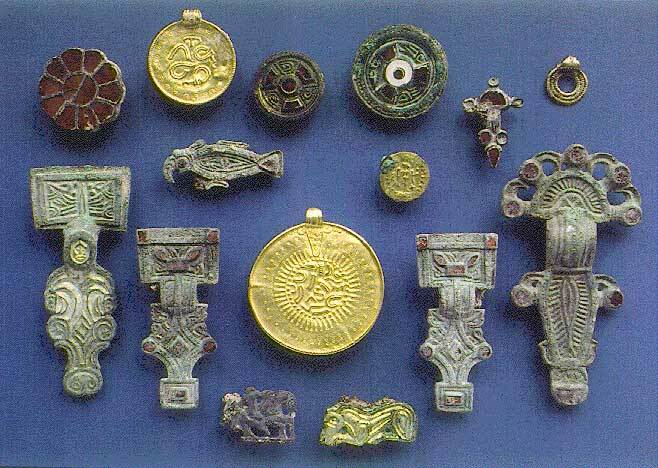 The finds at Sutton Hoo and Stafford shire give us some idea of the splendor and variety of treasures that they wore.